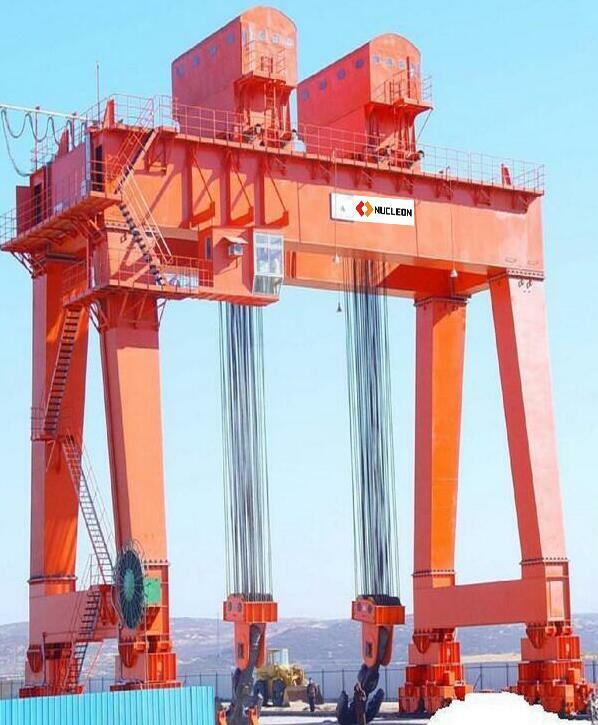 With the continuous increase of gantry crane market and its widely application, the problem of gantry crane repair, especially the repair and reinforcement of the structure, has aroused more and more attention. In the reinforcement scheme, according to the specific stress and stress concentration characteristics of the chassis: The chassis is a beam type structure, which is mainly subjected to bending stress, and the stress is concentrated at the position where the distal end of the supporting leg is connected with the center rotation, and the cross section of the chassis is a box type structure. According to the actual situation, combined with the construction requirements, we decided to use the difference between the transverse plate, paste plate reinforcement, and the two pieces of plate with a diagonal plate welded into one of the scheme, so that the three plates form a solid tripod structure, through theoretical calculation, the strength improve more than 15%, to meet the actual use requirements. In the selection of gantry crane materials, we first identified the parent material, analysis of the main chemical elements and various mechanical properties of the parameters required for the selected material. The chemical composition is close to the base material to ensure the welding effect; The mechanical properties exceed the base material to ensure the strength requirements; The selected new material, the base material and new materials were sampled and then welded together by failure test results for base metal fracture, shows that the new material and welding strength are greater than the parent material, ensure the construction quality and strength. In the welding process, we mainly from the cleaning preheating, electrode drying, processing and strengthening plate, welding machine, welding construction procedures and welding insulation and six aspects to be requested so on, so as to ensure the construction quality. In the aspect of strength test, it is mainly to check that all the welds must not leak and burn through, There shall be no cracks and no fusion defects in the welding seam. The main board is welded to the first class, and the weld is two grade, Weld defect inspection. After the weld has reached the above four requirements, the lifting test, The stress test of the structural part is carried out, and the percentage of the strength of the chassis structure is judged according to the test method of the strain of the gantry crane, According to the method of testing the gantry crane to determine the percentage of the strength of the chassis structure, and then compared with the actual requirements of 15%, so as to draw the conclusion that the construction is qualified.